Related for my interest in things magnetic. 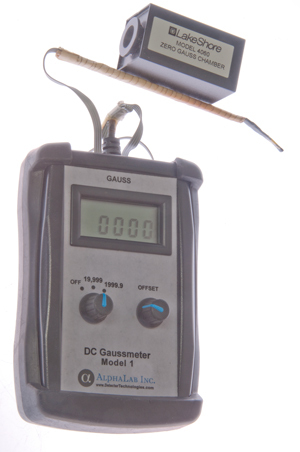 This DC Guassmeter (Wiki: Magnetometer). It can measure both DC and AC fields. In Fig 1 above the display is reading zero after the offset was set to 0000 using the LakeShore 4060 Zero Guass Chamber (also see: . 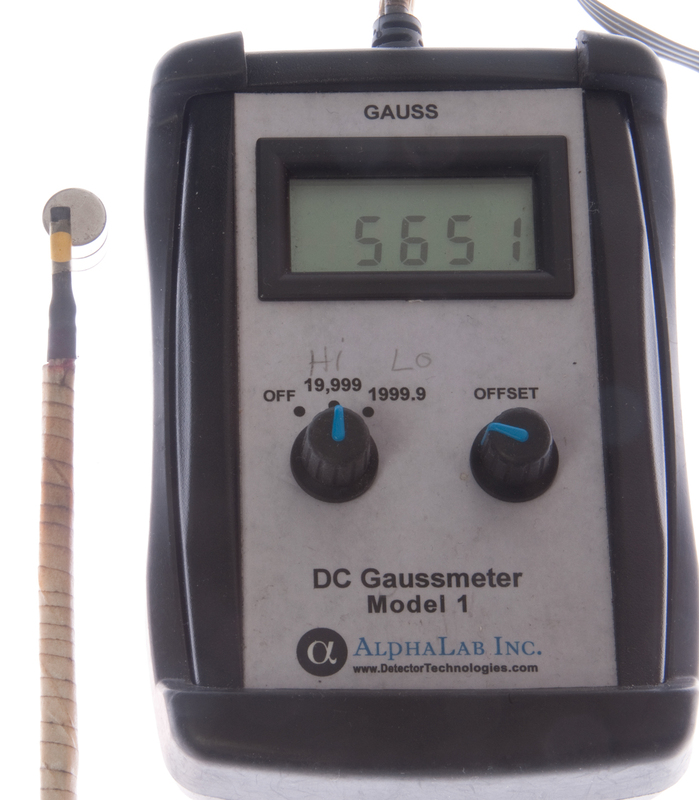 The display is showing 0000 on the 19,999 Gauss range. The Earth's magnetic field is about 50,000 nano Tesla or 0.5 Gauss. The Earth's field does not show up on the high range. The low range is 1999.9 Gauss full scale, so the Earth's field can just be seen, but not really measured because there's only one digit changing and the stability of the zero adjustment is not that good. 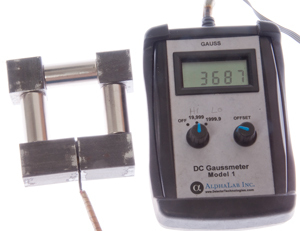 By placing a couple of 2-1/2" long nails, back to back on the sensor the reading can be multiplied by about 7 times making the maximum Earth's files show up as about 7 Gauss. Placing the probe on the end of a K&J Magnetics DCX8 (3/4"dia x 1-1/2" cylinder, N43, Ni) causes an overflow indication (-1). gap to generate a much stronger field, but it didn't work. 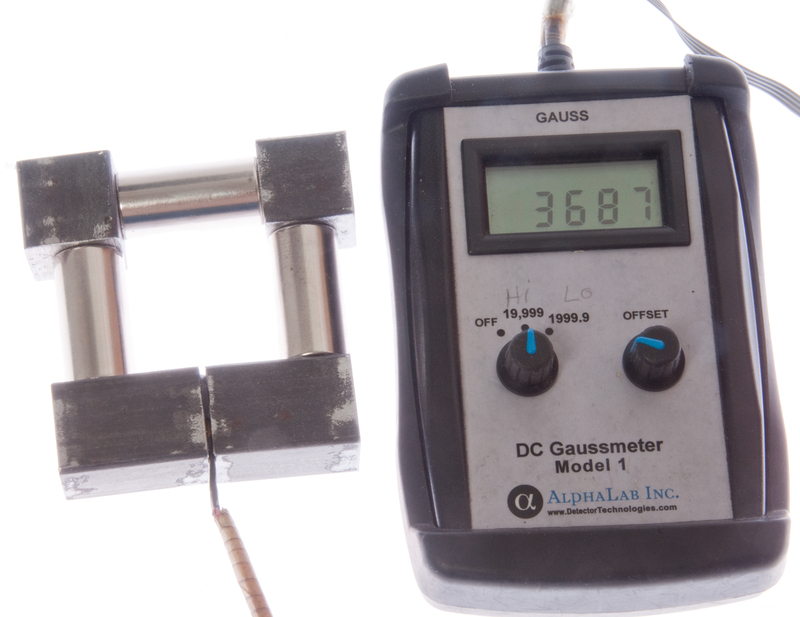 Fig 4 Three small magnets read 5651 Gauss. 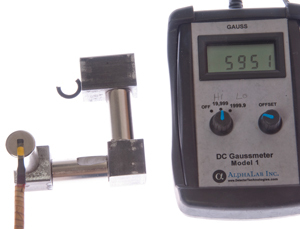 Fig 5 4127 Gauss in gap by making the gap about the same size as the probe. 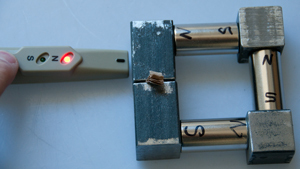 Fig 6 Used the AMY6 Magnetic Tester to mark each magnet. 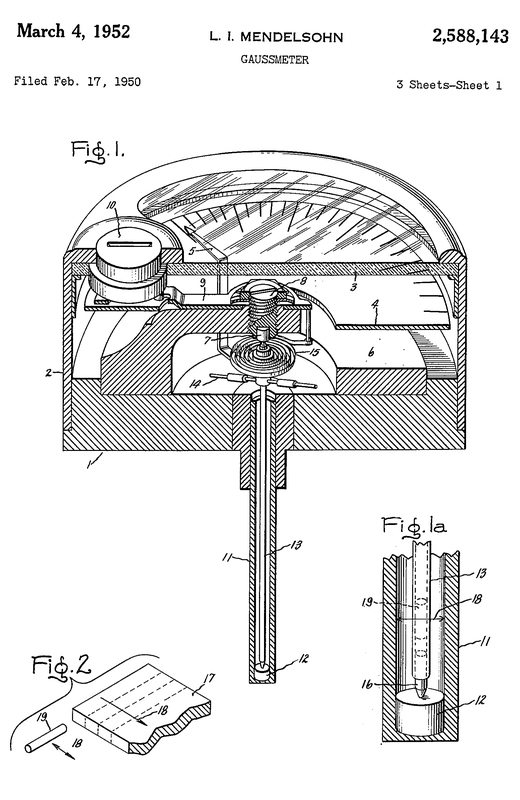 To use this meter you need to rotate it in order to get the peak torque on the needle. When the probe is placed in the 2500 Gauss Standard Magnet it reads 2300 Gauss. I'm guessing the standard is not as strong now as it was over 50 years ago. But the meter is still working! uses a small permanent magnet. 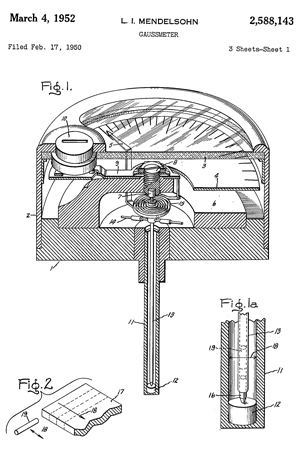 The meter body is rotated to get maximum reading. 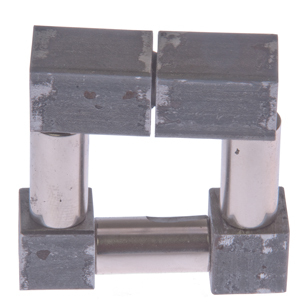 Makes use of CuNiFe material as described in patent 2196824, Permanent magnet consisting of copper, nickel and iron. 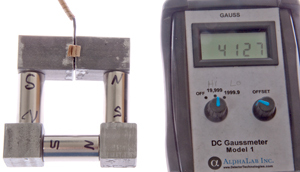 Unlike most magnets this material can be rolled into thin sheets where the magnetic grain is aligned, see Fig 2 above, and so very small magnetic needles can be formed. This metal alloy was used in the Fender Telecaster guitar pickup. Fig 2 Rotate pocket clip 90 degrees to access battery compartment. Install four batteries with positive (+) to black pocket clip end. Note: battery polarity is shown on compartment cover. Fig 3 Piezo beeper just under pocket clip at end. Case halves cemented together so not easy to open. Fig 4 Video of Wrong & correct use. This is a magnetic polarity tester that runs on four LR44 button cell batteries. A red (North) or green (South) LED turns on and a beep sounds to indicate the polarity of a magnet. 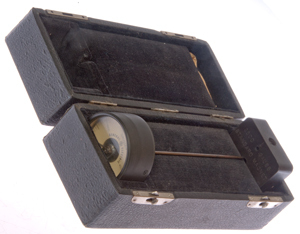 This is handy to be sure you're connecting permanent magnets the way you intended. The results are sort of ambiguous because the result depends on the orientation of the probe. The probe is designed to be used end on, not on either side. See the above video to see the proper orientation of the probe. Press button and move end of tester toward pole of magnet. 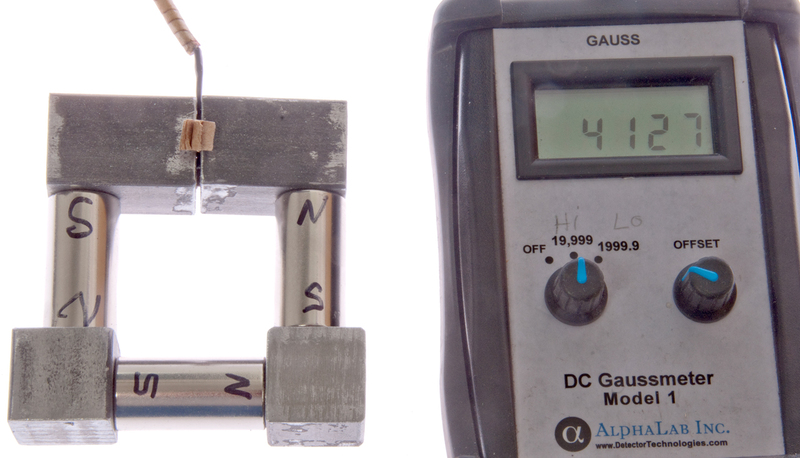 It is not correct to move either side of the tester to magnet pole.